The development of Ag-presenting functions by murine dendritic cells (DCs) of the CD8+ DC lineage was studied using a Flt-3 ligand stimulated bone-marrow culture system. Although newly formed DCs of this lineage are capable of Ag uptake and efficient presentation to T cells on MHC class II, they initially lack the ability to cross-present exogenous Ags on MHC class I. Cross-presentation capacity is acquired as a subsequent maturation step, promoted by cytokines such as GM-CSF. The development of cross-presentation capacity by the DCs in these cultures may be monitored by the parallel development of DC surface expression of CD103. However, the expression of CD103 and cross-presentation capacity are not always linked; therefore, CD103 is not an essential part of the cross-presentation machinery. These results explain the considerable variability in CD103 expression by CD8+ DCs as well as the findings that not all DCs of this lineage are capable of cross-presentation. The common function of dendritic cells (DCs) is the uptake, processing, and presentation of Ags to T cells. However, different subsets of DCs show specialized variations on this theme. In steady-state mouse spleens, the minority population of CD8+ conventional DCs has a selective ability to cross-present exogenous Ags on MHC class I (1–3). This function is crucial for the generation of cytotoxic T cells against virus infections and for maintaining tolerance to self tissues (4). However, in a recent study approximately half of the CD8+ DCs of mouse spleens were found to be functioning as cross-presenting DCs in vivo (5). It was not clear whether this finding reflected the existence of distinct subtypes of CD8+ DCs or whether the acquisition of cross-presenting function was a developmental stage of one basic DC subtype. A minor subset of migratory DCs, marked by the expression of the integrin CD103 and langerin (CD207) but lacking CD8 expression, has been shown to have an ability to cross-present Ags similar to that of the tissue-resident spleen CD8+ DC subset (6, 7). The CD8+ DCs of spleens may also express CD103, although reports on the extent of expression vary widely. An early study found that all spleen CD8+ DCs expressed CD103 (8), whereas a recent study found only half (i.e., those located in the marginal zone) expressed CD103 (9). In contrast to these studies, we found that less than 10% of the spleen CD8+ DCs in our mice of the same C57BL/6 strain showed strong staining for CD103. We therefore investigated factors that could induce CD103 expression on these DCs and related that to the capacity of these DCs to cross-present Ag. To study the late stages of DC development in detail, we used cultures of bone marrow cells stimulated by fms-like tyrosine kinase 3 ligand (FL) (10–12). These cultures serve as a model of spleen DC development, including progression through the same DC precursors as found in vivo (13). Although CD8 is not expressed by these cultured DCs, the equivalents of the CD8+ DC subset (eCD8+ DCs) are produced and can be recognized by other markers characteristic of spleen CD8+ DCs, specifically as CD11c+MHC II+CD24+CD11b−CD172a− (Sirpα−) cells (12). When isolated these eCD8+ DC show the same functional properties as spleen CD8+ DC, including the ability to cross-present cell-bound Ags (12). Over several years we have noted the same variability in CD103 expression by these eCD8+ DCs as in the studies of spleen CD8+ DCs. We therefore examined the factors that might explain this variability. In addition to finding cytokines that induce CD103 expression, we also found that CD103 served in these cultures as a marker of an important new developmental step. Although the first DCs of the CD8 lineage to develop from precursor cells were able to take up and process exogenous Ags for MHC class II presentation, they were not yet capable of processing exogenous cell-bound or soluble Ags for presentation on MHC class I. The ability to cross-present Ags required further development that was enhanced by GM-CSF. All mice were on a BL/6 background. C57BL/6J WEHI mice (CD45.2, 5–8 wk old) were the source of bone marrow cells for DC development in culture. To provide filler cell cultures for reculture experiments, the bone marrow cells were obtained from C57BL/6 Pep3b CD45.1 mice. To monitor langerin expression bone marrow cells from Lang-enhanced GFP mice (14) were cultured. Irradiated spleen APCs were obtained from B6.C-H-2bm-1 (bm-1) mice (15). OT-1 CD8 T cells were purified from lymph nodes of mice that were transgenic for OVA (257–264) specific, H-2Kb restricted TCR (16). OT-2 CD4 T cells were purified from lymph nodes of mice transgenic for OVA(323–339)-specific, I-Ab-restricted TCRs (17). All mice were bred under specific pathogen-free conditions at the Walter and Eliza Hall Institute. Recombinant mouse FL was produced in a Chinese hamster ovary cell line and purified in our laboratory. rGM-CSF was obtained from Peprotech. The blocking mAb against GM-CSF was MP1-22E9. Recombinant human TGF-β1 (TGF-β1; Chemicon) was used at 10 ng/ml. IL-3 (R&D Systems) was used at 5 ng/ml. Endotoxin-free OVA protein, routinely used as a soluble Ag for cross-presentation assays, was obtained from Profos AG. The commercial OVA protein used as a soluble protein in preliminary experiments and also used to coat irradiated spleen cells was obtained from Sigma-Aldrich. OVA257–264 MHC class I restricted peptide (SIINFEKL) was used at 250 pg/ml. OVA MHC class II restricted peptide (OVA323−339) was used at 1 μg/ml. CpG1668 (Geneworks) was used at 0.5 μM. The mAbs used for analysis and sorting were purified and conjugated in our laboratory. Anti-CD11c (N418) was used as a FITC or allophycocyanin or Qdot655 conjugate. Anti-CD172a (Sirpα; p84) was used as an Alexa 633 or FITC conjugate. Anti-CD45RA (14.8) was used as a PE conjugate. Anti-CD103 (M2/90) was used as a biotin conjugate with Streptavidin-PeCy7 second stage. Anti-MHC class II (M5/114) was used as an allophycocyanin or FITC conjugate. Anti-CD80 (16-10.A1), Anti-CD86 (GL1), and Anti-CD40 (FGK45.5) were used as FITC conjugates. The initial cultures were prepared as described elsewhere (12). Bone marrow nucleated cells (1.5 × 106 cells/ml) were cultured in modified RPMI 1640 medium containing 10% FBS, either in 0.2 ml in round-bottom wells of 96-well culture trays or in 30 ml in 75-cm2 tissue culture flasks. FL was included in the medium at 100 ng/ml. In later experiments, GM-CSF (300 pg/ml) was also included in the medium to improve DC yield. Unless otherwise stated, culture normally for 8 d at 37°C in 10% CO2 in air. To induce a high proportion of CD103-expressing DCs at day 8, additional GM-CSF (1 ng/ml) was added to the cultures at day 6. The cultured cells were washed twice in fresh medium before additional experiments. The cultured cells were counted and stained and analyzed for CD11c, CD45RA, CD172a, MHC class II, and CD103, together with propidium iodide (PI) to exclude dead cells. For functional studies, viable MHC class II+ CD11c+ CD45RA− CD172a− cells were selected and sorted into CD103 bright and CD103 negative fractions. For analysis of direct presentation, the staining of MHC class II was omitted. Analysis was performed on an FACScan or LSR II instrument, with sorting performed on an ARIA instrument (all from Becton Dickinson). DCs were isolated and enriched from lymphoid tissues as described elsewhere (18). The CD8+ DC were selected as CD11c+ (N418-Quantum Dot 655), CD172a− (P84-FITC) and CD8+ (YTS169.4-PerCp.Cy5.5) and segregated according to CD103 expression (M2/90-biotin and PE.Cy7-Streptavidin). The CD8 lineage DCs that had not yet expressed CD8 were selected as CD11c+, CD8−, CD172a−, and CD24+ (M1/69-AlexaFluor 680). Analysis was performed on an LSR II instrument and sorting on an FACS ARIA II instrument (both from Becton Dickinson). The assay was performed as described previously (3). The Ag source was spleen cells from gamma-irradiated (15Gy) bm1 mice, coated with OVA protein (Sigma Aldrich; 10mg/ml), washed and suspended in culture medium. The responding cells were OT-I CD8 T cells, labeled with CFSE, and then suspended in culture medium. Cultures were prepared in the V-bottom wells of 96-well culture trays in a final volume of 0.2 ml culture medium normally containing 20 ng/ml GM-CSF. The cultures contained 25,000 sorted DCs, 1 × 105 OVA-coated spleen cells and 5 × 104 OT-I T cells. The cells were cultured for 60 h at 37°C. A fixed number of calibration beads was then added to each culture, the cultured cells were stained and analyzed on a FACSCalibur instrument (Becton Dickinson) for the number of proliferating T cells (CFSElow PI–), gating OT-I cells as CD8+Vα2+. The assays were performed as described previously (2, 19) and similar to the above including the use of V-well trays and the inclusion of GM-CSF (20 ng/ml) in all the incubation media. However the DC number was normally 10,000, and the Ag source was either soluble endotoxin-free OVA protein (normally 100 μg/ml) or MHC class I restricted OVA-peptide 257–264 (250 pg/ml) or MHC class II restricted OVA-peptide 323–339 (1 μg/ml). The Ag was preincubated with the DCs for 2 h, and the DC were washed three times before incubation for 60 h with OT-1 T cells for MHC class I presentation, or with OT-2 T cells for MHC class II presentation. Purified CD103− or CD103+ and CD172a− DCs (8 × 105) were incubated in the presence of 5 mg/ml soluble OVA (Sigma-Aldrich) for 1 h at 37°C, then washed 3 times to remove excess OVA protein. The Ag-pulsed DCs were cultured for 20 h in the presence or absence of 1 ng/ml GM-CSF. Biotinylated Ab 25-D1.16 (eBiosciences) (20) was used to detect surface KbOVA257–264 complexes. DCs were incubated with this Ab on ice for 30 min and washed twice, and then 25-D1.16-biotin binding was detected by staining with streptavidin-PE (BD Pharmingen) for 30 min. Stained cells were assayed by flow cytometry (LSR-II; Becton Dickinson). Sorted CD103− or CD103+ DCs (1 × 104 cells in 0.2 ml) were incubated for 30 min at 37°C with OVA conjugated to Alexa-488 (50 μg/ml). Cells were washed twice after incubation, and viable PI-excluding cells were analyzed on an LSR II instrument (Becton Dickenson). Culture of C57BL/6 mouse bone marrow cells with FL routinely produced a high yield of CD11c+ DCs. As shown previously (12) and demonstrated in Fig. 1A, these cells could be segregated into discrete subsets. The first division is into CD45RA+ plasmacytoid cells (pDCs) and CD45RA− conventional DCs. The DCs can in turn be divided into CD45RA− CD172a+ DC and CD45RA− CD172a− DC subsets. The latter is the putative equivalent of a spleen CD8+ DC and is therefore termed eCD8+ DC. We found that CD103 expression was largely a feature of the eCD8+ DCs. The pDC always showed negative staining, whereas the CD172a+ DC sometimes showed low staining. However the staining for CD103 of the CD172a− DC (the eCD8+ DC) showed marked variability over several years, varying from a predominance of bright-staining cells to a predominance of low to negative cells. One common pattern is shown in Fig. 1A, where both CD103 bright positive and CD103 negative CD172a− DCs are produced at day 8 of culture. Both the CD103− and CD103+ CD172a− cells stained positive for cell surface MHC class II; therefore, by this criterion both would be considered newly formed DCs, rather than DC precursors such as pre-cDC (21). Precursor-product relationships and the induction of CD103 on cultured eCD8+ DCs by GM-CSF. A, Bone marrow cells from C57BL6 CD45.2 mice were cultured for 8 d with FL (100 ng/ml). The produced eCD8+ DCs, gated as CD11c+ CD45RA− MHC class II+ CD172a−, were further subdivided into CD103− and CD103+ subsets and sorted as shown in the upper panels. The sorted CD103− and CD103+ subsets were then recultured into ongoing parallel 8-d cultures of bone marrow cells from CD45.1 mice, to maintain the day 8 medium and filler cell conditions. In one series, GM-CSF (10 ng/ml) was added to the reculture medium. At the additional times stated, these secondary cultures were harvested and analyzed, gating for viable CD45.2+ cells and analyzing these for CD172a and CD103 expression, as shown in the lower panels. One experiment typical of three undertaken is shown. B, Bone marrow cultures were prepared and stimulated with FL (100 ng/ml) plus a low level of GM-CSF (300 pg/ml). Cultures continued for 8 d without further treatment (standard conditions), or additional GM-CSF (1 ng/ml) was added at day 6 and culture was then continued for 2 days (+GM-CSF day 6). On analysis at day 8, the DCs were gated as viable CD11c+ CD45RA− cells, the eCD8+ DCs selected as CD172a− and the CD103− or CD103+ subsets selected according to the gates in the upper plots. The expression of MHC class II or of various costimulator molecules on these subsets was determined as shown in the lower profiles. The results are from one of two experiments giving similar results. To determine the developmental relationship between these two subsets, they were first sorted from day 8 cultures of CD45.2 bone marrow as CD11c+ CD45RA− MHC class II+ CD172a−, CD103–, or CD103+ cells. The purified DC subtypes were then recultured for 1 to 3 d by mixing them into ongoing cultures of CD45.1 bone marrow, so that the normal culture environment was maintained. On reanalysis, the recultured DC were gated as CD45.2+, eliminating the filler cells. As shown in Fig. 1A, the CD103-negative cells gradually expressed surface CD103, whereas the CD103-positive cells remained CD103 positive. As a result, these newly formed subsets of eCD8+ DC were precursor-product related, the CD103− component being the precursor form. When GM-CSF (10 ng/ml) was added to the above secondary cultures along with the transferred CD103− CD172a− DCs, the rate of subsequent expression of CD103 was increased (Fig. 1A). This finding suggested that GM-CSF might be the variable factor determining the extent of CD103 expression in different cultures. Although GM-CSF had not been added to these primary cultures, there was evidence that small amounts were produced endogenously. When blocking Abs against GM-CSF were added at the beginning of the culture, the yield of DCs was reduced (Table I). The addition of GM-CSF to the initial culture medium at high levels inhibited DC production, because of outgrowth of other cell types. However, when small amounts of GM-CSF (300 pg/ml) were added along with the FL at the commencement of culture, the DC yield was increased (Table I); therefore, this was adopted as our standard cytokine mix for initiating the cultures. This low level of GM-CSF added with FL at the beginning of culture did not induce any increase in CD103 expression (Fig. 1B). However, if additional GM-CSF (1–5 ng/ml) was added at day 6 of culture, the overall DC yield was increased (Table I), and a much higher proportion of the CD172a− DCs produced at day 8 expressed high levels of CD103 (Fig. 1B); therefore this was adopted as a routine procedure for producing CD103+ eCD8+ DC in culture. When gated and analyzed, both the CD103+ and the CD103− CD172a− DCs expressed MHC class II, CD80, CD86, and CD40 on the cell surface, as would be expected of equivalents of spleen CD8+ DCs (Fig. 1B). The CD103− subset contained more DCs with lower levels of these markers, which agrees with the finding that the CD103− cells are the earlier forms of the eCD8+ DC subset. However, all these markers were at lower levels than on fully activated or mature DCs and both populations would be classified as immature DCs by comparison with the DCs found within mouse lymphoid tissues (19). Do the CD103+ cells from culture model spleen resident DC or migratory DC? We previously concluded that the CD172a− DCs that developed in the FL-stimulated bone marrow cultures modeled the spleen tissue resident CD8+ DCs. However, the expression of CD103 raised the possibility that we were generating an equivalent of the migratory CD8− CD103+ DCs, which share many of the same properties, including a dependence on FL (22) and on the transcription factors Batf3 and IRF8 (23) for their generation. One difference between spleen CD8+ and migratory CD103+ DCs of C57BL mice is the expression of a much higher level of langerin by the latter (24). Accordingly, we tested whether langerin was expressed by the CD172a− DCs from our standard cultures or was acquired along with CD103 on addition of GM-CSF at day 6. 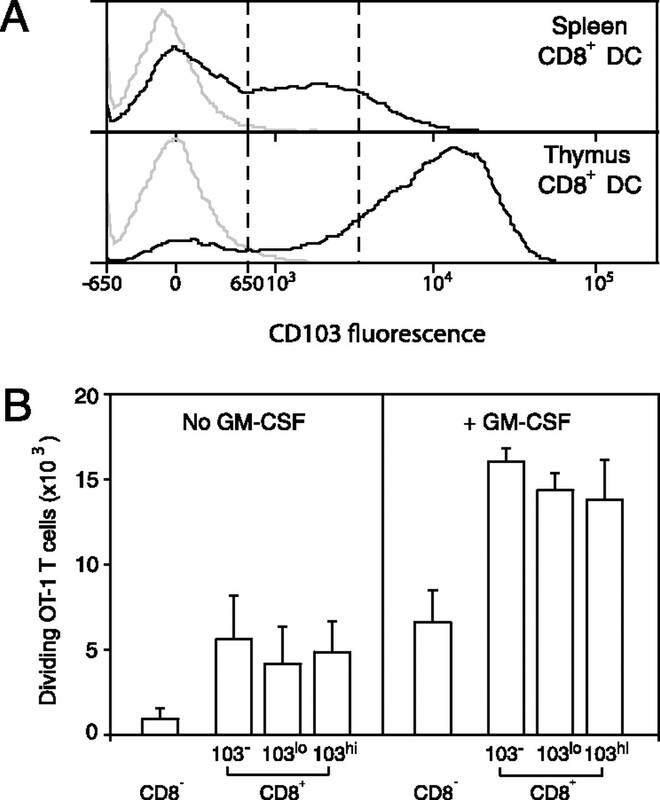 To allow detection of langerin, Lang-enhanced GFP mouse bone marrow was cultured; however no significant langerin fluorescence was detected in the CD172a− DCs, neither before nor after the induction of high levels of CD103 with GM-CSF (data not shown). Although the presence of some early stages of the migratory CD103+ DC population could not be excluded, the produced DCs modeled spleen resident CD8+ DCs more closely, and the term eCD8+ DC was maintained. An important functional specialization of the spleen CD8+ DCs is the ability to cross-present exogenous cellular Ags on MHC class I. To assess the relative ability of the two subsets of eCD8+ DCs to cross-present, we used a well-established assay with OVA-coated spleen cells as Ag. The DC subtypes sorted from cultures were incubated for 60 h with irradiated OVA-coated bm1 spleen cells and CFSE-labeled, OVA-specific MHC class I restricted OT-1 T cells. The total number of divided OT-1 cells (recognized by reduced CFSE fluorescence) was used as a measure of cross-presentation ability. GM-CSF (20 ng/ml) was normally added to all the final assay cultures to improve DC viability. Responses were 2- to 10-fold lower in the absence of GM-CSF. We first confirmed the previous findings (12) that the ability to cross-present cell-bound Ags was restricted to the CD172a− DCs. The CD103− and CD103+ subtypes of the CD172a− DC were then compared. The cross-presentation ability of the CD103+ subtype was ∼3-fold higher than that of the CD103− subtype (Fig. 2A). Even the low activity of the CD103− CD172a− DCs seemed likely to be caused by a maturation of some of these cells to the CD103 expression state early in the assay cultures, especially since GM-CSF was included in the assays. These results indicated that much of the cross-presentation previously reported for the eCD8+ DC (12) could be ascribed to the CD103+ component. Cross-presentation of cell-bound and soluble Ag by the CD103− and CD103+ subsets of eCD8+ DCs. The CD103− subset was sorted from standard condition cultures with low levels of GM-CSF in the culture medium, the CD103+ subset from cultures with extra GM-CSF added at day 6, as in Fig. 1B. However, the eCD8+ DCs were selected as both CD11c+ and MHC class II+. A, The presentation of OVA-coated spleen cells by the sorted DC subsets was measured by the proliferative response of CFSE-labeled OVA-specific OT-1 CD8 T cells. In this assay the DC, the OVA-coated spleen, and the responding OT-1 were incubated together for the 60-h of culture in the presence of 20 ng/ml GM-CSF. Results are the pooled data (±SD) from two experiments, each involving triplicate assays. B, A DC dose response of the cross-presentation of soluble endotoxin-free protein OVA by the CD103− and CD103+ eCD8+ DC subsets. The DCs were incubated with a fixed 50-μg/ml dose soluble OVA protein for 2 h and then washed twice before a 60-h incubation with the CFSE-labeled OT-1 cells. GM-CSF (20 ng/ml) was present in the medium during both incubations. The mean (±SD) of pooled data from two experiments is shown. C, An Ag dose response of the cross-presentation of soluble endotoxin-free protein OVA, using a fixed DC dose of 5000 cells. Conditions were the same as for B. The mean (±SD) of pooled data from two experiments is shown. D, The development of cross-presenting DCs from non–cross-presenting DCs. CD11c+MHC classII+CD45RA−CD172a− CD103− DCs were sorted from day 7 cultures. Samples were taken for assay of cross-presentation of OVA protein (100 μg/ml OVA, 10,000 DCs). The DC were recultured for 2 d in the conditioned medium from the 7-d cultures, supplemented with GM-CSF (1 ng/ml). The harvested cells were then reassayed for cross-presentation of OVA protein. Results represent the mean (±SD) from a single experiment. Similar results were obtained after 1 d of reculture in conditioned medium. We then tested the ability of the cultured DC subsets to cross-present soluble OVA protein. This test offered the advantage of a tighter control of assay parameters and a defined pulse of Ag, because the OVA protein was first incubated with the isolated DCs for only 2 h and then the Ag was washed away before the 60-h incubation with OT-I cells. GM-CSF (20 ng/ml) was again included at all assay incubation steps to maintain DC viability. We first verified that the CD172a− DCs, but not the CD172a+ DCs from our current cultures were able to cross-present soluble OVA, because there is one report of a failure to see cross-presentation of soluble OVA by CD172a− DCs from FL cultures (25). We found the CD172a− DC fraction as a whole was active in this assay, and we proceeded to test the separate CD103− and CD103+ subtypes. The ability to cross-present soluble OVA was largely confined to the CD103+ subtype of CD172a− DC (Fig. 2B, 2C). The CD103− subtype showed much lower relative activity in this soluble OVA presentation assay than in the cell-bound OVA presentation assay, presumably because the short time of Ag contact reduced the possibility of maturation to the functional CD103+ state during the Ag uptake phase. Because the CD103− and CD103+ DC subtypes in the above experiments were obtained from separate cultures, it was important to check whether the cross-presenting DCs were directly derived from preformed CD103− DCs that did not cross-present or whether they had an independent origin from earlier precursors. Accordingly, CD103−CD172a−CD45RA−CD11c+MHC class II+ DCs were isolated from 7-d cultures initiated with low levels of GM-CSF. Next, samples were recultured for 1 or 2 d in the supernatant of the 7-d cultures supplemented with high levels (1 ng/ml) of GM-CSF. The isolated non–cross-presenting eCD8+ DC developed into cross-presenting DCs (Fig. 2D), demonstrating that there was a direct precursor-product relationship at the level of function and at the level of CD103 expression. These cultured DCs also acquired CD103 expression, as in Fig. 1A (data not shown). Some requirements for efficient cross-presentation of soluble OVA protein were revealing. The DC dose response under these conditions of responder T cell excess was nonlinear (Fig. 2B), suggesting that DC–DC interactions enhanced the response. Responses were found to be higher in the V-bottom wells used than in round-bottom wells, in line with DC-DC contact enhancing the response. The addition of GM-CSF to the assay medium, our standard conditions, resulted in responses 3- to 5-fold higher than in medium alone. Increased survival of the DCs during the assay seemed one likely explanation, because the survival of CD103+ DCs after 18 h of culture was only 15% in medium alone, but 62% in the presence of GM-CSF. However, the use of some commercial preparations of OVA protein instead of our standard endotoxin-free preparations gave up to 8-fold higher response in medium alone, and then the addition of GM-CSF to the assay medium gave little enhancement of the response. This finding suggested that traces of microbe-derived contaminants had a similar effect to GM-CSF. Overall, additional activation steps appeared to be required during the culture assay for effective Ag cross-presentation to occur, even with DCs that already expressed CD103. It was important to determine whether the differences observed in the proliferation of OT-1 cells in the cross-presentation assays were simply due to differences in costimulation of the T cells. One test was to incubate the DCs with the OVA257–264 peptide recognized by the OT-1 cells instead of with soluble OVA protein, because the preformed peptide would not require processing. The OVA257–264 peptide was used below the saturation level to ensure that a reduction in response could be measured. The DCs were incubated with the peptide for 2 h, and then the DCs were washed and incubated with the OT-1 cells. The CD103− and CD103+ subsets of the CD172a− DCs responded well after loading with the OVA peptide (Fig. 3A). The excellent response of the CD103− subset to the peptide contrasted with the low response to OVA protein in side-by-side assays (Fig. 3A). This finding indicated that the functional differences between the subsets were at the level of Ag uptake and processing, rather than at the level of costimulation of the T cells. The near equivalent responses to the OVA peptide also indicated that the differences between the subsets in cross-presentation assays were not due to differential death of the DC before effective interaction with T cells, because once loaded with peptide the subsets were nearly equivalent in T cell stimulation ability. 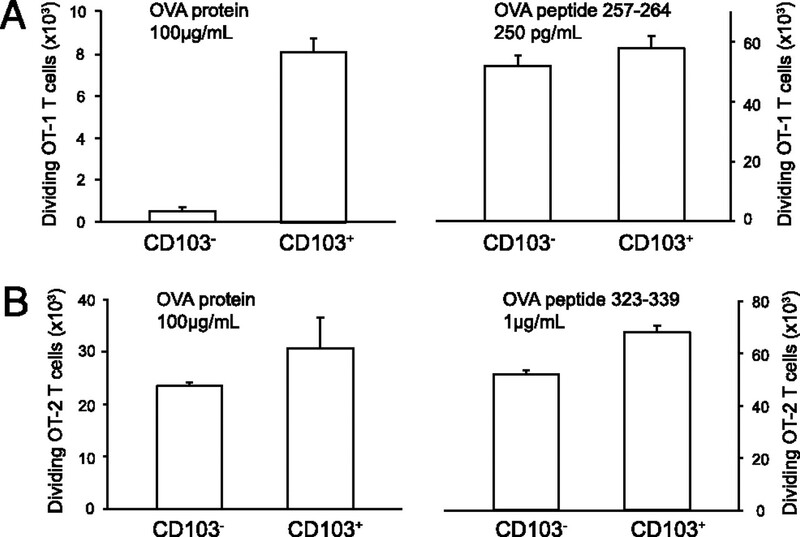 Comparison of cross-presentation and direct presentation of OVA-protein and OVA peptide by the CD103− and CD103+ subsets of eCD8+ DCs. DC subset isolation was the same as in Fig. 2, except that staining and selection for MHC class II was omitted for the direct presentation experiments, to avoid blocking Ag binding. Assay conditions were similar to Fig. 2, with the DCs being preincubated for 2 h with either soluble protein OVA or the corresponding OVA peptide for 2 h before the 60-h incubation with CSFE-labeled OVA-specific T cells. Single experiments are presented (±SD) and are representative of two of each performed. A, Side-by-side comparison of cross-presentation of soluble OVA protein with presentation of the OVA257–264 peptide, using OT-1 cells as the indicator of presentation on MHC class I. B, Side-by-side comparison of direct presentation of soluble OVA protein with presentation of the OVA323–339 peptide, using OT-2 cells as the indicator of presentation on MHC class II. To directly assess Ag presentation by MHC class I on the DC surface, a mAb was used that stains KbOVA257–264, the same MHC class I–OVA peptide complex recognized by the OT-1 cells (16). The sorted CD103+ and CD103− subsets of the CD172a− DCs were incubated with soluble OVA protein for 1 h, washed free of Ag, and incubated for an additional 20 h. The DCs were then recovered and stained for the peptide–MHC class I complex on the DC surface. Although the CD103− DCs showed marginal staining above background, only the CD103+ DCs showed definite positive staining (Fig. 4A). It was notable that GM-CSF was required in the cultures to obtain effective staining. Because the fluorescence assay involved gating on viable, PI-excluding DCs, it was clear that GM-CSF promoted Ag presentation within individual CD103+ DC during these assays and improved overall DC survival. These results confirm that the increased OT-1 proliferation induced in these assays by the eCD8+ DC after they express CD103 reflects an increase in OVA cross-presentation on MHC class I. Direct staining for OVA-protein cross-presentation on MHC class I, compared with cellular uptake, by the CD103− and CD103+ subsets of eCD8+ DC. DC subset isolation was the same as in Fig. 2. A, Cross-presentation. The DCs were incubated for 1 h with or without soluble protein OVA, with or without GM-CSF, washed, and incubated an additional 20 h before staining with the Ab specific for the KbOVA257–264 complex. The heavy line is the staining with Ag preincubation, and the broken line is the background staining without Ag present during preincubation. One of three experiments giving similar results is shown. B, Total uptake into the cells. The DCs were incubated for 2 h at 37°C with Alexa488-labeled OVA protein, mimicking the conditions of preincubation with OVA protein in Fig. 2. The DCs were then well washed and the fluorescence within the cells (heavy line) were compared with the background of DCs incubated without the labeled Ag (broken line). Control experiments involving incubation at 0–4°C showed only marginal uptake above the background (data not shown). One of two experiments giving similar results is presented. Because exogenous Ag presentation on MHC class I was limited in the CD103− eCD8+ DC, but effective once these DCs expressed CD103, we asked whether the difference was at the level of Ag entry into the DC. The entry of labeled OVA protein into these DCs was measured after the same incubation period used in the cross-presentation assays. 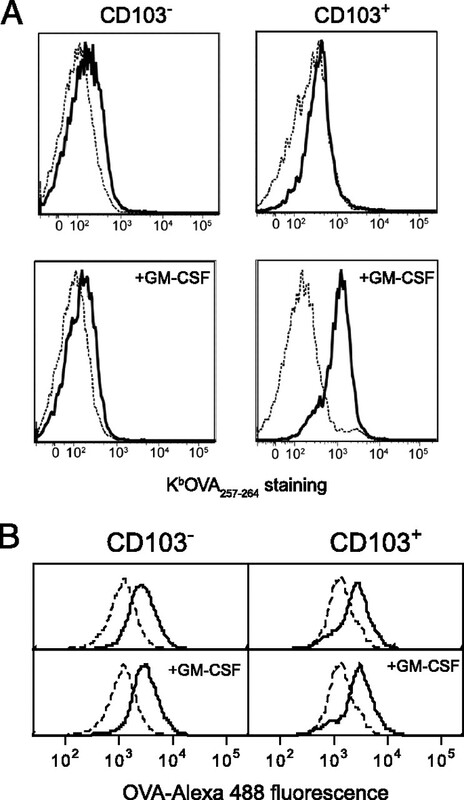 The CD103+ and CD103− subsets showed similar uptake of OVA into the cells, and this was not affected by the presence or absence of GM-CSF (Fig. 4B). The functional difference between these DC subsets appeared to be at the level of Ag processing rather than Ag uptake into the cells. Although spleen CD8+ DCs are specialized for cross-presentation of Ags, they are also capable of direct presentation of exogenous Ags on MHC class II (2, 3). Likewise, the CD172a− and CD172a+ DCs from the FL stimulated bone marrow cultures have been shown to present soluble OVA protein on MHC class II and so stimulate OVA-specific OT-2 T cells (12). Accordingly, we tested whether there was any difference in direct presentation of soluble protein OVA between the CD103− and CD103+ subtypes of the eCD8+ DC, by substituting OT-2 cells for OT-1 cells in the final assay. We also compared presentation of soluble OVA protein with that of the MHC class II restricted OVA323–339 peptide, to test whether any differences found were at the level of Ag processing or capacity to activate the OT-1 T cells. In sorting the DC subsets from the cultures for these tests, MHC class II staining was omitted, and DCs were sorted on CD11c alone to avoid blocking MHC class II presentation. This procedure usually resulted in the contamination of the CD103− fraction with ∼10% MHC class II− late DC precursors (Fig. 1B). Both the CD103− and CD103+ subsets of the CD172a− DCs efficiently presented soluble OVA protein to OT-2 T cells, in contrast to the results with OT-1 cells (Fig. 3B). The OT-2 proliferative response induced by the CD103− DC was a slightly lower than that induced by the CD103+ DC, which could be explained by the presence of the small proportion of MHC class II negative DC precursors in this fraction. In accordance with this interpretation, the reduction was also reflected in the response to the OVA peptide, indicating that it was largely at the level of final MHC class II presentation and activation of the T cells, rather than representing a general defect in Ag processing. Overall it appeared that the CD103− subset of the eCD8+ DC lineage was already capable of exogenous Ag uptake and of processing the Ag for MHC class II presentation, but lacked the ability of the CD103+ subset to process the same Ag for MHC class I presentation. It was important to determine whether CD103 expression was always closely linked to cross-presentation ability. We first determined the effects of several different cytokines. Although variable levels of GM-CSF in our previous cultures seemed the most likely reason for the variable expression of CD103, we tested whether other cytokines had a capacity to induce CD103 expression. These cytokines were added to the cultures at day 6, and the expression of CD103 was determined at day 8, as for GM-CSF. IL-3 and TGF-β1 were effective at inducing CD103 on the CD172a− DC (Table II, Fig. 5A), but not on the CD172a+ DC. Comparison of CD103 expression with the cross-presentation capacity of eCD8+ DCs under different conditions. A and B, GM-CSF (1 ng/ml), IL-3 (5 ng/ml), or TGF-β (10 ng/ml) were added at day 6, as in Table II. The CD103+CD172a− DCs were isolated from day 8 cultures. A, Representative CD103 expression profiles are shown. B, Each CD103+ DC population was then isolated and assayed for the ability to cross-present soluble OVA protein at 100 μg/ml, with GM-CSF in the assay culture medium, as in Fig. 2. Results are the pooled data (±SD) from two experiments giving similar results. C and D, CD103−CD172a− DCs were isolated from day 8 cultures under standard conditions. C, The DCs were incubated for 1 d with CpG (0.5 μM) and then stained and analyzed for CD103 expression. A representative profile is shown. D, The CD103− DCs were assayed for cross-presentation of OVA protein, in the presence or absence of CpG (0.5 μM), with or without GM-CSF in the assay. Results are the means (±SD) of the pooled data from two experiments. To determine whether the CD103+ CD172a− DCs induced by different cytokines shared a capacity to cross-present Ags, they were sorted from cultures and then assayed for their ability to cross-present soluble OVA protein, adding GM-CSF to the assay cultures as before. The CD103+ DCs induced by IL-3 showed a similar cross-presentation capacity to those induced by GM-CSF (Fig. 5B). However, the CD103+ DCs induced by TGF-β1 displayed a poor cross-presentation capacity, despite expressing a similar level of CD103 and despite the presence of GM-CSF in the final assay cultures (Fig. 5B). Another way of inducing cross-presentation in the CD103− eCD8+ DC, independent of the requirement for GM-CSF, was to include CpG in the cross-presentation assay (Fig. 5D). However, over the time of this assay CpG induced little CD103 expression by the DCs (Fig. 5C). Overall the level of expression of CD103 was not tightly linked to the capacity to cross-present Ags. To determine whether similar findings applied to CD8+ lineage DCs in vivo, the level of expression of CD103 was determined, and DCs expressing various levels of CD103 were sorted for assay of cross-presentation capacity. The expression of CD103 on the surface of spleen CD8+ DCs was analyzed in detail and compared with that of thymus CD8+ DCs, because we previously found that the latter expressed high levels of CD103. As we had observed previously, few spleen CD8+ DCs expressed the same high levels of CD103 as seen on the thymus CD8+ DCs isolated from the same mice (Fig. 6A). However, the use of a bi-exponential plot resolved two approximately equal populations of spleen DCs expressing low levels of CD103 (termed CD103lo) and DCs lacking any detectable surface expression. The cross-presentation capacity and expression of CD103 by spleen CD8+ DCs. A, The expression of CD103 by CD8+CD172a− DCs from the spleen. The CD103 levels on thymic CD8+CD172a− DCs are shown as an example of high CD103 expression. Results are typical of three such analyses. B, Cross-presentation of soluble OVA in the presence or absence of GM-CSF by CD8+ spleen DC fractions sorted on the basis of CD103 expression according to the gates shown in A. The results are compared with cross-presentation by the CD8−CD172a−CD24+, early CD8-lineage DCs isolated from the same spleens. Results are the means (±SD) of pooled data from two experiments. Spleen CD8+ DCs with the various levels of CD103 expression were then sorted and assayed for capacity to cross-present soluble OVA protein (Fig. 6B). All fractions showed a high capacity for cross-presentation in these assays, higher than the culture-derived eCD8+ DC. Similar to the culture-derived DCs, full activity depended on the presence of GM-CSF. There was no correlation between CD103 expression and cross-presentation activity; however, it was not clear whether the DCs separated as CD103hi were a true population resembling the thymus CD8+ DCs or simply a tail of the CD8lo population. A major difference between the spleen CD8+ DCs and the eCD8+ DCs from culture is the expression of CD8α, a relatively late marker of this lineage. However, the spleen does contain a small population of CD8-lineage DCs that have not yet expressed CD8, which resemble the eCD8+ DCs from culture (18, 26). These early CD8-lineage DC can be distinguished from the true CD8− DCs by the high expression of CD24 and the low expression of CD172a; they are negative or low for expression of CD103. These CD8-lineage DCs were therefore also sorted from the spleen and assayed for cross-presentation capacity; they were lower in cross-presentation activity than the CD8-expressing DCs, and this activity was highly dependent on GM-CSF. Thus, these early CD8-lineage DCs in spleens closely resembled the eCD8+ DCs generated in culture. This study has clarified the basis of variations in the surface phenotype and functional performance of DCs produced in FL-stimulated bone marrow cultures. However, the findings go beyond this technical aspect and provide some new insights into the final stages of DC development. We will first discuss the technical aspects. The first point of interest is the multiple roles played by GM-CSF in the development of a FL-dependent DC lineage. Although GM-CSF is usually considered as an inflammatory cytokine, it is important that low-level production occurs in steady state (27). The production of all the DC subtypes produced in these cultures was enhanced by low levels of GM-CSF present with FL at the beginning of the culture. This conclusion supports the finding that GM-CSF promotes FL-dependent steady-state DC development in vivo (28). In addition, at a later stage of culture GM-CSF acted on newly formed CD172a− DCs to promote CD103 expression and Ag processing function. The level of GM-CSF produced within the cultures is therefore a likely candidate for the factor determining the past variability in the DCs from these cultures. 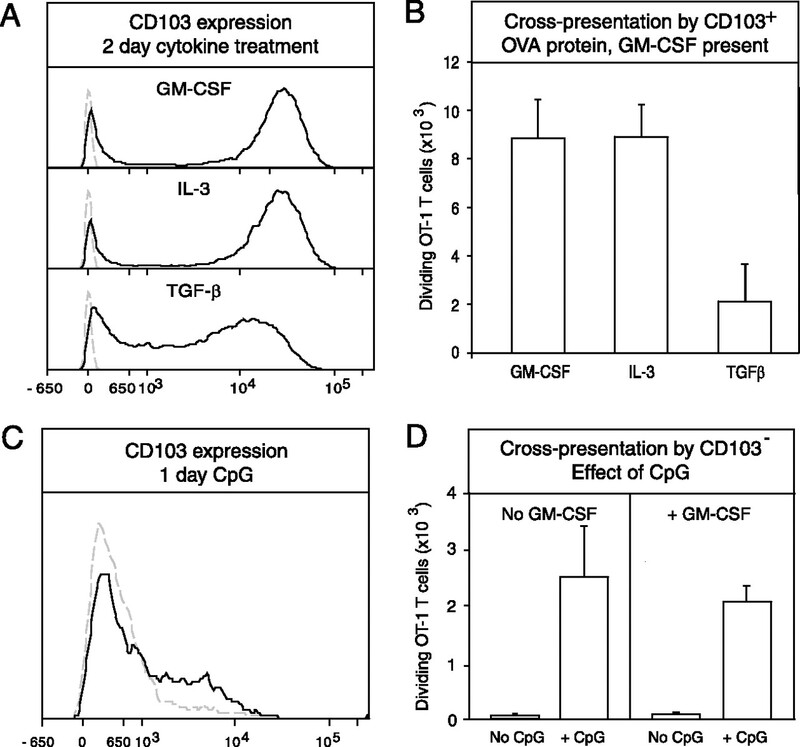 Because we found the cytokines IL-3 and TGF-β1, as well as GM-CSF, promoted CD103 expression, any of these cytokines might be the cause of the marked variability in the CD103 expression by spleen CD8+ DCs. In addition, GM-CSF present in the assay cultures served to promote Ag cross-presentation by our culture-generated DCs, even when the CD172a− DCs already expressed CD103. Although some part of the enhanced cross-presentation activity could be ascribed to the conservation of DC viability in culture, in our studies GM-CSF appeared to promote cross-presentation even within viable DC populations. DC activation signals given by microbial products may also promote cross-presentation, because we found that endotoxin-free OVA protein preparations give lower responses than conventional commercial OVA preparations. In addition, we found that cross-presentation is enhanced if CpG is included in the assay, which indicates that Ag cross-presentation must be actively promoted during these culture assays. Even the nonlinear DC dose response fits this requirement for further activation, because we have recently demonstrated that the spontaneous activation of freshly isolated DCs when cultured is a consequence of DCs activating each other when in close contact (29). The most important and basic finding from this study is the identification of a stage in the development of the CD8+ DC lineage when the newly formed DCs are unable to cross-present soluble or cell-bound Ags effectively, even when enhancing factors such as GM-CSF are present in the assay cultures. These early DCs are CD11c+ and MHC class II+, so by surface phenotype would be classed as DCs rather than as DC precursors. The in vivo equivalent of this stage is likely to be found within the CD8-lineage DCs that, like the culture-derived DCs, do not yet express CD8α (18, 26). Importantly, these early CD8-lineage DCs are fully capable of uptake of exogenous soluble Ag and of processing and presenting the Ag on MHC class II. Finally, these DCs are fully capable of activating Ag-specific CD8 T cells if the appropriate peptide is provided exogenously to load their MHC class I molecules. Accordingly, they would be classed as functionally active DCs; however, at this stage these newly formed DCs lack the machinery to process exogenous proteins for MHC class I presentation. We suggest that the non–cross-presenting then cross-presenting forms represent successive developmental stages of the one CD8 DC lineage. In our FL-driven bone marrow culture system, the expression of CD103 serves as a useful marker of the development of the eCD8+ DC into a cross-presenting DC. However, it is not clear whether CD103 itself is in any way involved in the process of cross-presentation. The level of surface expression of CD103 can be dissociated from the capacity of the DCs to cross present, because in our studies the induction of high levels of CD103 by TGF-β1 did not lead to an efficient cross-presentation capacity. In addition, the enhancement of cross-presentation by the presence of CpG in the cultures did not lead to an immediate upregulation of CD103 expression. Thus, CD103 expression may merely be a secondary indicator of separate but parallel developmental events. Langerin (CD207), also a marker of cross-presenting migratory DCs (6, 7), may sometimes serve as a similar indirect marker of maturation to cross-presenting function in spleen CD8+ DCs. The ability of spleen DCs to cross-present Ags was recently shown to be restricted to a langerin+ CD8+ DC subset (30), yet the cross-presenting ability of spleen CD8+ DCs was not abolished in mice with the langerin gene disrupted (31). In line with this, the cross-presenting CD103+ eCD8+ DCs we have generated in culture lacked langerin expression. How well do our results with our culture-derived eCD8+ DCs agree with the CD8+ DCs found in vivo? The history of variable expression of CD103 on spleen CD8+ DCs suggests a close parallel with our culture results. Y. Zhan and A. Lew (personal communication) have found that GM-CSF will induce CD103 expression on spleen CD8+ DCs in vivo. C. Dresch and C. Fraefel (personal communication) have found that spleen DCs require GM-CSF to display full cross-presentation activity, in accordance with our findings, but thymus DCs that express high levels of CD103 cross-present effectively in the absence of GM-CSF. However, as we found with culture-generated DCs, the expression of CD103 is not always a good indicator of cross-presentation capacity. We found that, at least in the presence of GM-CSF, all the CD8+ DCs of spleens displayed high cross-presentation activity in culture assays, even when they lacked any detectable CD103 expression. The CD8-lineage DCs of spleens that have not yet expressed CD8α seemed closer in cross-presentation capacity to our culture-derived eCD8+ DCs. We suggest that the activity of factors such as GM-CSF that regulate cross-presentation activity, rather than the presence or absence of CD103, is the reason why only half of the spleen CD8+ DCs were found to be capable of Ag cross-presentation in vivo in cytochrome c ablation experiments (5). The most important conclusion from this study is that Ag cross-presentation function is not built into the CD8+ DC lineage, but is acquired as a later developmental event. Such functional maturation is influenced by cytokines in the environment. This finding has important implications for the generation of cytotoxic T cell responses and resistance to viral infections. Because it is now clear that BDCA3+ Clec9A+ DCs represent the human equivalent of the mouse CD8+ DC lineage (32), there are further implications for human immune responses. The finding that this human DC subset required activation by TLR ligands to display cross-presentation capacity (33, 34) no longer seems out of line with the mouse CD8+ DC, in view of our present finding that mouse DCs also require activation or maturation stimuli for efficient cross-presentation. In addition, because the human BDCA3+Clec9A+ DCs do not express CD8α, they may more closely resemble our culture-derived eCD8+ DCs or the early CD8-lineage spleen DCs, which do not yet express CD8α. Determining the factors that drive and regulate the development of newly formed CD8+ DCs to a fully functional Ag cross-presenting state in vivo will be important in understanding the immune responses initiated by this DC lineage in both humans and mice. We thank Dr. A. Lew, Dr. W. Heath, Dr. C. Dresch, and Dr. C. Fraefal for constructive discussions.
. 2000. CD8+ but not CD8− dendritic cells cross-prime cytotoxic T cells in vivo. J. Exp. Med. 192: 1685–1696.
. 2001. Cutting edge: intravenous soluble antigen is presented to CD4 T cells by CD8- dendritic cells, but cross-presented to CD8 T cells by CD8+ dendritic cells. J. Immunol. 166: 5327–5330.
. 2008. Selective suicide of cross-presenting CD8+ dendritic cells by cytochrome c injection shows functional heterogeneity within this subset. Proc. Natl. Acad. Sci. USA 105: 3029–3034.
. 2009. Cross-presentation of viral and self antigens by skin-derived CD103+ dendritic cells. Nat. Immunol. 10: 488–495.
. 2010. CD207+ CD103+ dermal dendritic cells cross-present keratinocyte-derived antigens irrespective of the presence of Langerhans cells. J. Exp. Med. 207: 189–206.
. 2009. Novel subset of CD8α+ dendritic cells localized in the marginal zone is responsible for tolerance to cell-associated antigens. J. Immunol. 182: 4127–4136.
. 2002. Murine plasmacytoid pre-dendritic cells generated from Flt3 ligand-supplemented bone marrow cultures are immature APCs. J. Immunol. 169: 6711–6719.
. 2005. Dynamics and function of Langerhans cells in vivo: dermal dendritic cells colonize lymph node areas distinct from slower migrating Langerhans cells. Immunity 22: 643–654.
. 1981. Biochemical studies on the H-2K antigens of the MHC mutant bml. Immunogenetics 12: 33–44.
. 2007. Production of interferons by dendritic cells, plasmacytoid cells, natural killer cells, and interferon-producing killer dendritic cells. Blood 109: 1165–1173.
. 2003. Most lymphoid organ dendritic cell types are phenotypically and functionally immature. Blood 102: 2187–2194.
. 2010. Peripheral CD103+ dendritic cells form a unified subset developmentally related to CD8α+ conventional dendritic cells. J. Exp. Med. 207: 823–836.
. 2007. Identification of a novel population of Langerin+ dendritic cells. J. Exp. Med. 204: 3147–3156. 2008. Demystifying the development of dendritic cell subtypes, a little. Immunol. Cell Biol. 86: 439–452.
. 1999. Receptor clearance obscures the magnitude of granulocyte-macrophage colony-stimulating factor responses in mice to endotoxin or local infections. Blood 93: 1579–1585.
. 2009. The concerted action of GM-CSF and Flt3-ligand on in vivo dendritic cell homeostasis. Blood 114: 835–843.
. 2010. Factors determining the spontaneous activation of splenic dendritic cells in culture. Innate Immun. In press.
. 2009. Langerin+ CD8α+ dendritic cells are critical for cross-priming and IL-12 production in response to systemic antigens. J. Immunol. 183: 7732–7742.
. 2005. Disruption of the langerin/CD207 gene abolishes Birbeck granules without a marked loss of Langerhans cell function. Mol. Cell. Biol. 25: 88–99.
. 2010. Found in translation: the human equivalent of mouse CD8+ dendritic cells. J. Exp. Med. 207: 1131–1134.
. 2010. Human CD141+ (BDCA3+) dendritic cells (DCs) represent a unique myeloid DC subset that cross-presents necrotic cell antigens. J. Exp. Med. 207: 1247–1260.
. 2010. Characterization of human DNGR-1+ BDCA3+ leukocytes as putative equivalents of mouse CD8α+ dendritic cells. J. Exp. Med. 207: 1261–1271.